Are you in search of the best Webcam for your system or website? I am damn sure, you must be! So, today we are sharing with you those awesome jQuery Webcam Plugins which offer a wide range of an image, better video quality and camera effects such as flash, camera shutter effect, webcam, etc. These Webcams plugins are cheaper than standard video cameras and allow to do online face-to-face communication with anyone and make easy to illustrate the things visually to the person you are talking to. In simple, we can say it is a transparent layer to communicate with a camera. It is a video camera that feeds or streams your images in a real-time through a computer to computer network. It also captures the images and later you can view or send on to other networks via the internet, and an emailed as an attachment. Now dig in and find most rated jQuery webcam plugins below. A jQuery Webcam plugin allows you to take pictures with a webcam. This plugin is often used in the corporate world for video conferencing. Its use makes remote work possible. jQueryWebcam uses an HTML video tag to provide the camera feed and a canvas to convert it to a picture. This plugin supports only HTML img element. It also enables the user to crop the images which have taken with the help of a webcam. Contains CropperDimension to set the proper dimensions of cropper images. By default [5, 5, 250, 313]. It supports picFormat so that you can easily export the picture format. The plugin provides a cropperSelectable section to select the image cropper area. It contains camWidth/camHeight function to fix the width & height of Webcam. 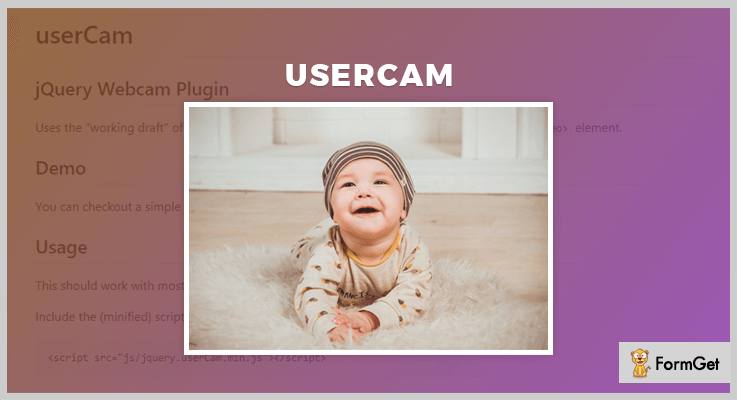 UserCam is a well-liked jQuery webcam plugin that takes snapshots, detect motion, colors of images, report-video clips and set up video chats. The plugin is a clear layer with which you can easily and clearly connect with your clients. UserCam works well with almost every jQuery versions. It includes the minified JS and CSS script on your HTML documents in order to make your website faster and provides clear vision. You can access the UseCam methods by accessing the container elements for any events or by conveying any messages. The plugin consists img src attribute to specifies the URL of the image. UserCam supports few additional parameters such as “start” which detects when the webcam starts and an “error” to detect when the error occurs during using a webcam. UseCam plugin is absolutely free to use. So you can download it straight away from GitHub’s site. jQuery Clipchamp MJPEG Player is a webcam recorder plugin that provides a simple player for MJPEG videos. It supports clipchamp.com to produce online video compressor and video converter. The plugin exposes a simple interface, which is accessible either by the jQuery API or by the AMD module which defines the application programming interface & dependencies of the plugin. It provides an autoloop service that specifies whether or not the video shall loop after coming to an end. With its WrapperElement and playerInterface, you can easily control the MJPEG webcam according to your need. It also consists of a finish function which can be called in order to stop or remove the player from wrapper element. 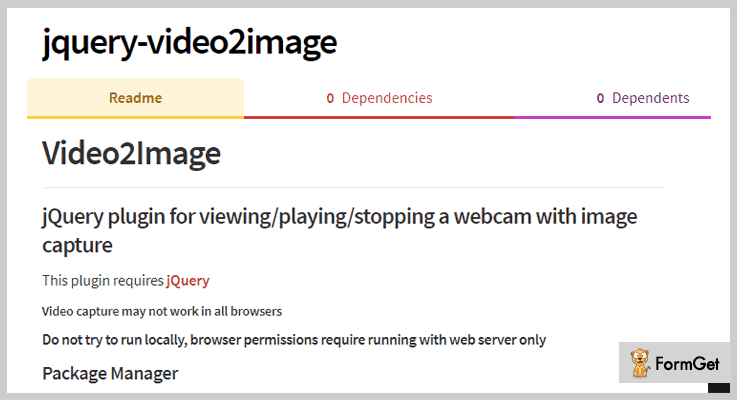 jQuery Video2image is a Webcam plugin that permits you to learn knowledge from a person’s webcam or different video size system. This jQuery Video2image is used for viewing/playing/stopping a webcam with image capture. jQuery Video2image supports NPM through which the plugin can be download. It contains a canvas id with which you can create a beautiful photo design. You can easily customize the width or height of the video/images while creating an image or video. It supports base64 form which encodes the binary data into numeric. jQuery Video2image is an entirely free plugin which will cost you $0 for all the features and facilities it provides. You can easily access it from github.com website. This is a well-liked jQuery plugin that allows the user to read data from a user’s webcam or other video capture devices. The plugin supports the various format in order to make it more ease such as swf file which stands for small web format that contains video and vector-based animations and a .flash plugin to bring consistent and engaging user experiences on your website. The plugin uses flash swf for the actual capture of the image until browsers support native webcam capture. jQuery.Webcam can optionally prompt the user to allow flash access the webcam. With the help of this plugin, you can develop a video to a canvas element (graphic elements). It supports callback function as well as a filter option. jQuery.Webcam is another webcam plugin which is available at free of cost. You can simply download it and take benefits of all its advanced features. jQuery webcam plugin is a transparent layer to communicate with the camera. It supports three different modes to access such as callback mode to bring the image on a canvas, save mode to store the image on the server and a stream mode to stream the live image on a canvas. The plugin supports adobe flash player to take an instant picture. It contains various parameters such as width, height, mode, swffile, onLoad etc. 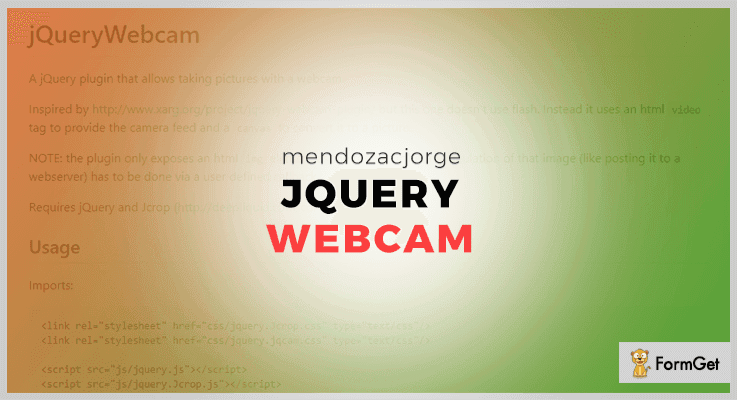 jQuery Webcam supports AJAX which is an alternative method to upload the image via flash. Another free of cost jQuery plugin which can easily be downloaded from github.com. 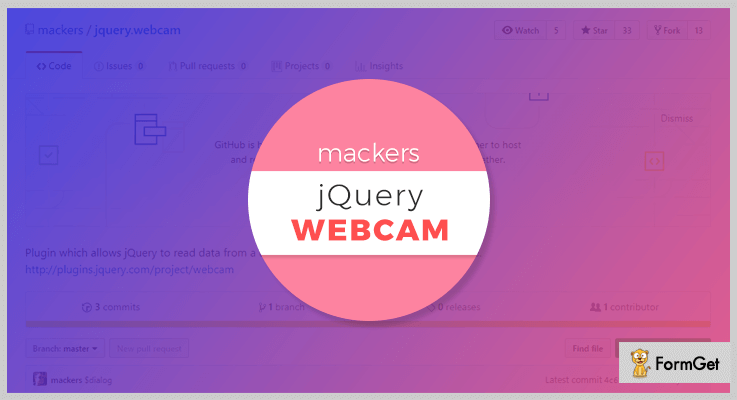 Now, these are our take on of jQuery Webcam Plugin and I am definitely sure that you must have found the relevant plugin in this article for your website. By getting one of these products you can make easy to illustrate the things visually to the person you are talking to. In case you have any doubts or queries regarding the plugins do let us know via your comment.